Shag rugs give any room much needed texture or a burst of vibrant color. They also look really cosy and every time I see one, I just want to walk on it barefoot and feel the soft strings of material against the soles of my feet. I have one in my bedroom and I love it. As it’s a relatively low traffic area, I can keep mine clean quite easily. I give it a quick vacuum once a week and that keeps it looking fluffy and inviting. On the other hand if you have one in your hall or living room where people are constantly walking over it, then keeping it clean and dust-free might be more difficult. If taking your shag rug outside and beating it isn’t an option to remove the dust, then let me tell you step-by-step how to vacuum it to remove the dust and dirt that collects under the dense pile. Step 1: Turn the Shag rug over so the pile is facing downwards. Step 2: Draw the vacuum across the full length of the rug slowly and controlled from left to right. You should keep the brush roller or beater bar enabled on your cleaner. 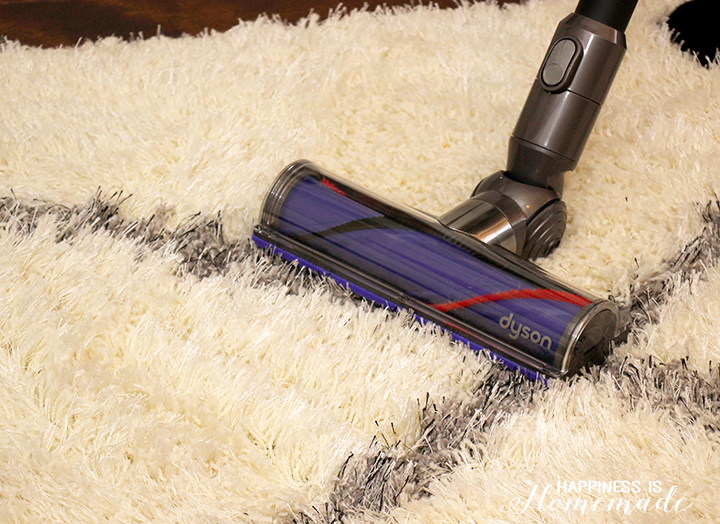 I use a Shark Rocket DuoClean and it does a great job of vibrating the rug as it moves across. This allows the dirt and dust to be loosened and sucked up. Step 3: This time move the vacuum across the rug from side to side. After you finish doing this step, you should have criss-crossed your way over the entire back of the Shag rug. Step 4: Pick up each corner of the rug and give it a brisk shake. Then pick up each side and give it a brisk shake also. This will allow any left-over particles to fall onto to the surface below. Step 5: Roll up your Shag rug and vacuum the area underneath where it was laying. Step 6: Turn the rug over so the pile is facing upwards again. Step 7: At this stage you should have gotten the majority of the dust and dirt out of your shag pile. The last part of the vacuuming process is using the upholstery brush attachment to remove the rest of the dust particles without damaging the pile. Move across the top of the rug slowly until you’ve vacuumed the entire shag rug. Read more of the best vacuum reviews and ratings.